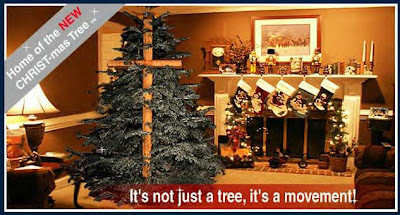 Stonewall Gazette: Putting Christ back into Christmas? A frickin' cross as part of the tree! WTF? Our collection of inspiring trees, wreaths and other decorations are designed to remind us of the true meaning of the Christmas holiday. Let us help you to put Christ back into Christmas this holiday season. It's not just a tree, it's a movement!